I kind of knew these pieces were hiding in this wooden bench, but I'd been ignoring them...for years! I guess I thought it would all go away if I left them alone. Alas. That didn't happen. 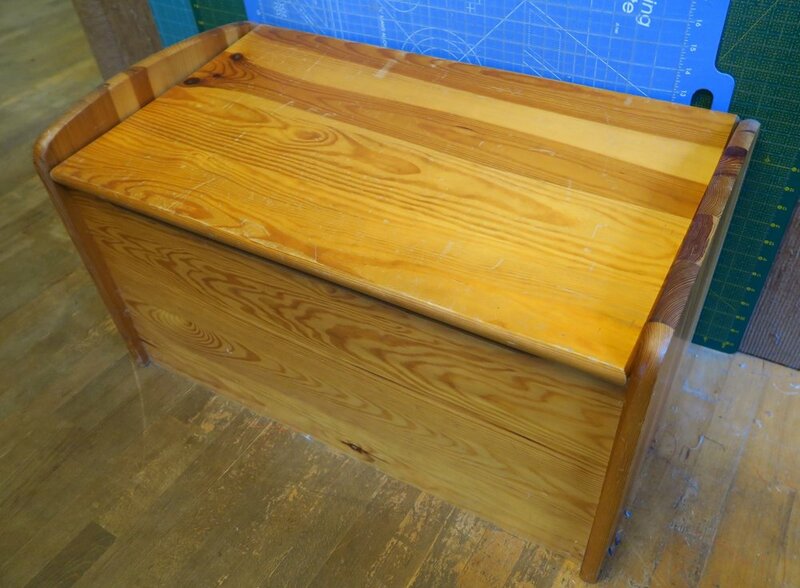 This is the wooden chest that held the strips - I had it filled with "stuff" that was then forgotten, or sort of forgotten about. I have since cleaned it out and put other stuff in there! I can't honestly say I am hanging my head in shame - I had simply been neglecting this almost finished top! Back story - This past week I decided to tackle straightening up my dining room/living room and get rid of/go through "stuff" that was just sitting around, making it look cluttered. I'm not done with that project, but I did make big progress. Part of that was cleaning out the wooden bench where these strips were. As I looked at it, I realized I was actually almost finished with this quilt top! I had known they were in that bench - I'd seen them - but hadn't actually "looked at" them lately, if you know what I mean. So, I just finished it! I already had the blocks together in rows and even sashed one direction. I tried to match up the white as best as I could and put the sashing in the other direction and sewed the strips together. Then I added simple borders and called it done. 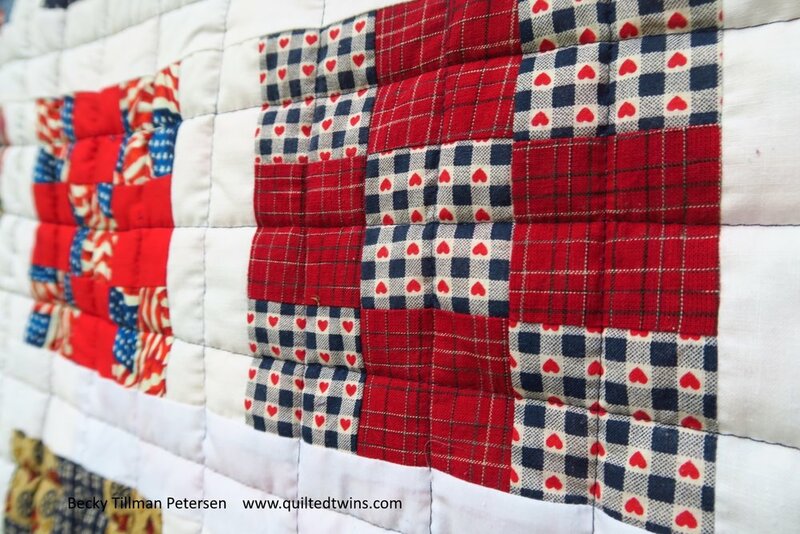 I think I lost enthusiasm for this quilt back when because it is Americana. I am an American, and very proud of it, but I don't wave my American flag much in public here. It's just not who we are and what we do. It doesn't seem like the right thing to do. That meant I wasn't sure what I was going to do with this quilt when I finished with it! So I didn't finish it. Maybe "life"happened and I just stopped working on it and just never got back to it. So, now I'm stumped as to what to do with it. I hate to use up the luggage space and take it back to the states. I think I need to find someone over here in Poland who would truly love it. What would you do with it if you were in my shoes? 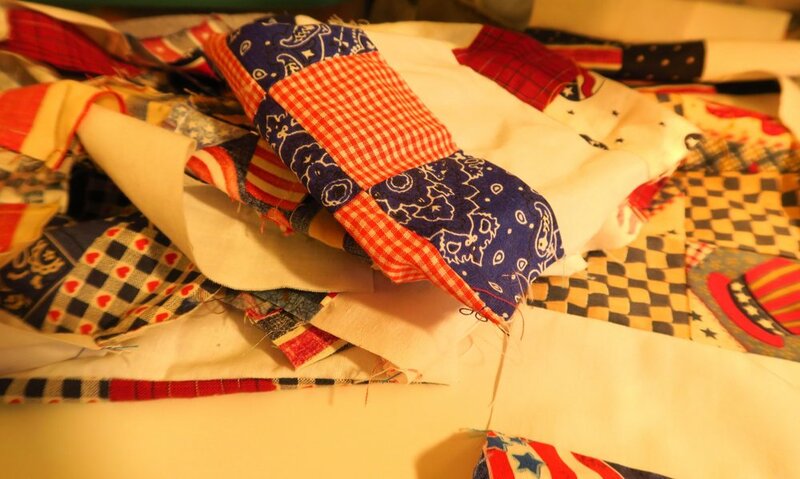 Since it is a patriotic scrappy - using red/white/blues, sometimes patriotic - Americana and some just plain fabric - I didn't think a pattern was necessary. I simply made 9 patches from 2.5" squares. I sewed those 9 patches (6.5" before put together in the top) together with a white sashing strip, cut 2.5"x6.5" for one direction. Then I sashed the other direction with long white 2.5" strips. The inner blue border was cut 2" and the outer flag border was cut 6.5". That's how I made it. 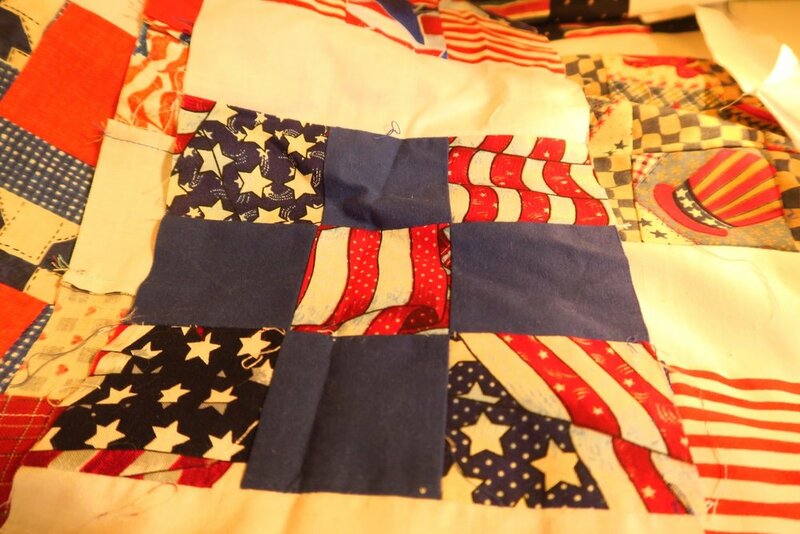 Don't forget to give me suggestions as to what to do with this patriotic quilt (now a queen size quilt). 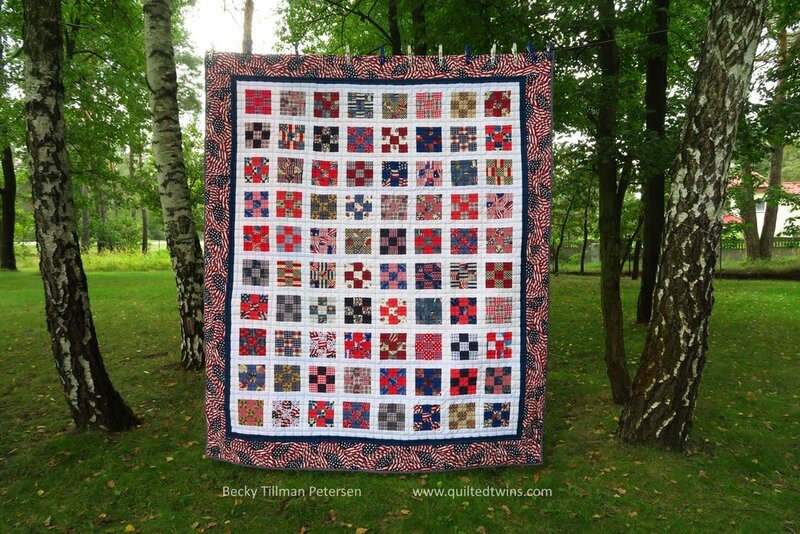 As usual, I do like to put up a picture of the quilt roll, if at all possible! And this is one of the quick finishes from my sewing room this past week! Don't forget to check out what my sis has for you over in the store! She's working hard to find incredible deals for you!